What do see see in the image of this sharp-tail grouse feather? The mystery of meaning is in part what keeps me going. Some of my favorite feather patterns remind me of the human form. And strangely, they tend toward either paleolithic, like images of people in cave paintings, or some alien humanoid race.The way patterns in a feather mean something to me doesn't have much to do with what the feather does for the bird. 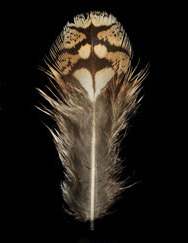 Example: the feathers on the back of a ruffed grouse show delicate heart shapes that remind me of valentines. I might go on to think that these birds must be more devoted, affectionate, and tender creatures than if they didn’t have heart shapes on their backs. This is mistaken pattern identification—thinking that how I perceive the world uses the same reality as the one an animal experiences. So I am wary of thinking that my perceptions of an animal based on its visual qualities is really what that animal is like. Think of grinding up rhinoceros horns to enhance male potency. Killing the animal and sawing off the long, upright, slightly bent Rhino horns for my own procreation-related ends because the parts look slightly the same is bad for the rhino. But probably giving meaning to a molted feather is a harmless pursuit.